When it comes to social media marketing, you need all the help you can get to stand out and get results. The competition is fierce and your budget is limited, so you need to make the most of your time and resources in order to make ensure your efforts are paying off. You need to find out what strategies actually work. Where your audience is online. What your audience actually wants to hear from you. And so, so much more. You can do much of this with one simple "trick": leveraging UTM tracking links. In this blog post, I’m going to show you how to use UTM tracking links on social media to help boost your results. You may have the best-laid campaign plans in the world, but if you don't use granular tracking codes in your analytics you won't learn what works and what doesn't to improve for the future. What are UTM tracking links? Source – The source of your traffic (for example, in this case, the link was shared on Facebook, so the source is "facebook" – that said, you can take things even further and track specific groups, posts, and so on). Medium – The type of traffic; in this case, that would be social/social media. Campaign – Is the campaign you’re holding, such as an ad campaign, a sales campaign, blog promotion, an a/b test you’ve set up, and so on. Some tools allow you to add even more parameters if you wish; generally, though, these are the main UTM parameters used to track links. You might now ask, why do you need this? After all, Google Analytics does tell you what social networks are driving you traffic. But while that’s certainly true, it actually doesn’t provide you with enough useful information. It tells you the main social network where your traffic is coming from – Facebook, Twitter, etc. – but it doesn’t tell you which of your efforts got those results. It doesn’t tell you which Facebook groups got you the most traffic, which sales updates got you the most conversions or even what comment got you more clicks. UTM tracking links tell you all of this information and much more if needed – it all depends on how you use these links. Another great thing about UTM links is that they are the perfect tool to help you test your social media strategy. What types of updates (images, videos, etc.) drive the most results? Where should you post your links for maximum traffic or conversions? There are a plethora of possibilities; UTM links are highly customizable and perfect for A/B testing. All of these uses for UTM tracking links help you in one major way: they ensure you understand your audience so you can optimize your social media strategy for improved results. Because if you know what works, you can implement it in your strategy and reach your goals faster – whether it’s to drive more traffic and awareness, make more conversions or generate more sales for your business. How do you create UTM links for social media? Arguably the most popular tool to create UTM links is Google’s own Campaign URL Builder. That said, there are some other useful tools that I’ll tell you all about, tools which are specifically for social media and therefore are more convenient to use in the long term. But first, here’s how the Campaign URL Builder works. As you can see above, the builder is very easy to use as it’s quite basic: all you have to do is enter the URL and the UTM parameter values that you need for the source (mandatory), as well as for medium and campaign (optional). As you enter this information in the form fields provided, the tool will automatically generate your URL. From here, it’s just a question of copying and pasting it where needed. Before you do that though, you can also use an URL shortener like bit.ly (they’re not exactly the best looking URLs around). You’ll then be able to track the results of your links in Acquisition -> Campaigns. 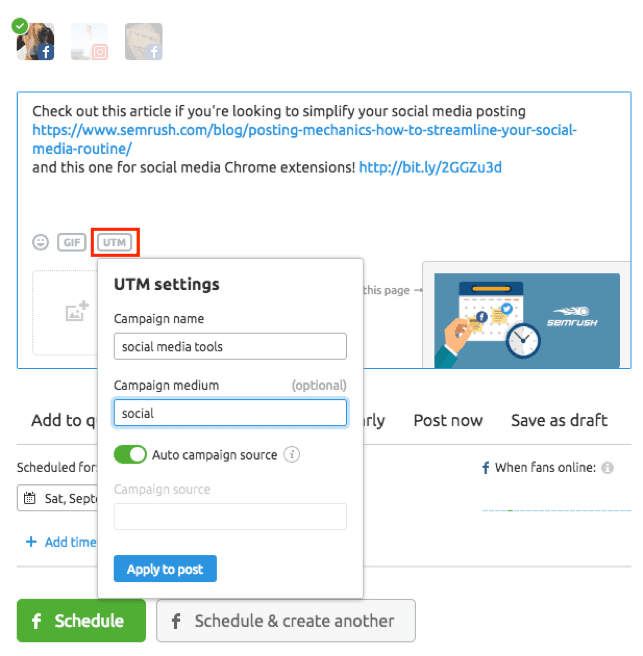 The SEMRush Social Media Poster is a social media posting tool with built-in UTM tracking links features. It’s all very straightforward: just give your campaign a name, set the medium and either add the source yourself or let the tool do it automatically. Another good option for those who want to leverage UTM links on social media (and want a tool that can help with their marketing and have UTM tracking), is Agorapulse. It has all the features you’d expect from a social media management tool, plus the ability to add UTM parameters to any links you schedule or publish on social. The really cool thing here is that you can add more custom UTM parameters if needed and you can set up dynamic UTM parameters. This is a time-saving feature for when you want to track the same link when shared on multiple profiles or social networks. You won’t have to customize each UTM link manually, as the tool can do it for you, automatically. For example, if you wanted to see which social networks get you the most conversions (or most traffic), you’d share the same link on each network, and select "dynamic" as the UTM "type". Then, select the value as either a social network or a social media profile and the tool will do the rest for you. One of the best uses for UTM tracking links is to set up tests and to use that knowledge to optimize your social media. To give you a simple example, UTM links can help you find out what types of updates get the best results (in terms of traffic, conversions, etc.) – just use different UTM links for each update you want to test and check your results. Then, you can use this knowledge to improve your future updates in order to get more positive results. Test to see which sales updates and calls to action get the most sales: If you want to make more sales on social media, then you need to find the tactics that work. Use different UTM links for each update to see which sales updates and calls to action work best. For example, Brayola use UTM links on all their sales updates in their Facebook community so they can see exactly which calls to action get them the most sales – the links looking something like this: https://shop.brayola.com/collections/crushworthy-basics/products/paramour-sensational-t-shirt-bra-135031?utm_source=Facebook_Organic&utm_medium=Facebook_Organic_November&utm_content=ES. As you can see, they’re tracking organic Facebook traffic in November and also use a UTM parameter to track specific content (utm_content=ES). Track ad comments: Whenever someone comments on one of your ads, why not use UTM links in your response? This is another thing that Brayola do on their community page in order to measure the ROI of engagement on their Facebook ads. Test social media groups: Which specific groups/communities get you the best results? For example, if you use several sharing groups to promote your content, you can use UTM links to see exactly how much traffic each group is bringing in. This way, you’ll be able to focus more on the groups that actually get you results, and remove the ones that don’t in order to save time. Another way to use UTM tracking links on social media is to track and measure your success. Likes and comments no longer mean much in the grand scheme of things – businesses and marketers, in many cases, would much rather see traffic and conversions. In other words, they want a return on investment (ROI). Measuring your social media success has its challenges, but with UTM tracking links you can make this task much easier. See how specific social media campaigns are performing: Have you set up a social media campaign? Create a UTM link (or several, if needed) for the landing page you’re promoting to see how it’s performing in terms of traffic, conversions and engagement. To help, use dynamic UTM parameters (as I mentioned earlier, some tools have this option, like Agorapulse) so you can track each social network or profile, depending on your needs. How each social network or profile is performing: UTM tracking links can help you understand exactly what is driving you traffic – social networks or profiles. You will be able to accurately track the results of any specific network or profile, instead of simply checking the traffic for an entire social network (Google Analytics only tells you how much traffic each social network sends you, but not the exact sources of this traffic – social networks, social media updates, social media groups, and so on). As I mentioned earlier, you can also set up conversion goals in Google Analytics so you can track more than just traffic, but also conversions made. Plus, if you assign these goals a monetary value, you’ll be able to check the ROI of each UTM link (and therefore the ROI of a campaign, social profile, or even a simple update).